Facebook has confirmed that it is opening up its Messenger service to third-party developers, allowing them to add functions of their own. It effectively completes the four-year-old software's transformation from a "lightweight" chat app, spun off from the main Facebook site, into a fully-fledged "platform" of its own. More than 40 new add-on apps have already been developed so far. But one expert said there was a risk Messenger would become bloated. Messenger has already proved controversial with some users of the social network, who have complained about having to switch between two apps to stay in touch with their Facebook friends. 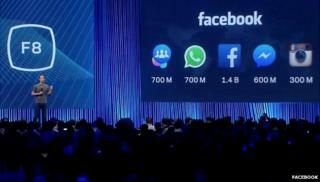 Facebook's founder Mark Zuckerberg announced the move at his firm's F8 developers conference in San Francisco. He said more than 600 million people already used Messenger at least once a month to express themselves, and that allowing other social networks and services to directly post to it would make "conversations better". It builds on a move to allow US-based users to send money to and from each other via Messenger, which Facebook announced last week, and the earlier inclusion of Voip (voice over internet protocol) calls and stickers. Mr Zuckerberg also revealed plans to launch an associated service called Businesses on Messenger. Using the app instead of email, the public will be able to hold conversations with companies from which they buy goods, or have other interactions with. Facebook suggested this could include receiving delivery status updates, organising the return of an order and asking follow-up questions. The company is far from the first to attempt to turn a messaging app into a wider platform. China's WeChat service has gone even further by allowing its users to book taxis, pick cinema seats and find nearby restaurants among other actions. But one expert suggested Facebook should be cautious about the rate at which it adds further facilities to Messenger. "There's a potential risk that they are going to overload Messenger with too many functions and none of them become that important - it really depends on how extensive they get with the features that they add over time," said Brian Blau from the Gartner tech consultancy. "We have seen something like that happen with Facebook's Timeline, where you have all these different people competing for your attention. "So, Facebook won't want to over-bloat, but it could enable all kinds of interesting scenarios where you can integrate messaging with other apps and services." Right now many of the Messenger apps look fun, if a bit gimmicky. But over time these new interactions will give Facebook another source of rich information about a user's interests - and thereby the potential to attract more ad revenue. Facebook would have taken inspiration from companies like China's WeChat and Japan's Line, which have proven successful in building both content and business services atop their core messenger offerings. But Messenger for Business is an ambitious plan. It is asking users to supplant more tried-and-tested means like email. Other communications behemoths like Skype tried - unsuccessfully - to become places to reinvent communications between businesses and their customers. Will users be happy to shift their business interactions over to Facebook - a platform where, until now, they have been used to dealing primarily with friends? Media captionWATCH: Facebook founder Mark Zuckerberg shows off "spherical video" which will soon be supported on the site.